Nigerian police have raided an isolated Muslim community in the western state of Niger, taking more than 600 people into custody. A team of 1,000 officers took part in the Saturday morning raid on the Darul Islam community, local media say. Police say no weapons were found and there was no resistance to the arrests. The raid comes in the aftermath of the violent uprising of the Boko Haram Islamist group last month in which hundreds of people died. A BBC correspondent says the authorities may be taking this opportunity to disperse the Darul Islam (or House of Islam) community. The settlement was established in the early 1990s to live according to strict Islamic principles, away from what they see as western decadence. After the recent bloodshed involving Boko Haram in the northern Nigerian city of Maiduguri, Darul Islam came under official scrutiny. One of the men taken away by the police told the BBC Hausa service they were being questioned at a secondary school in Makwa, the nearest town. He said: "We have not eaten anything since we were brought here and we have women and children among us." 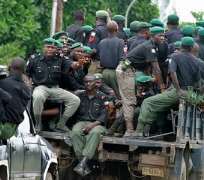 "It was a team of security officers including policemen and immigration officers, operating under the instruction of the federal police command, who came to our village." The inclusion of immigration officers is important, according to Mannir Dan-Ali, editor-in-chief of the Nigerian newspaper Daily Trust. "The authorities are trying to establish the identity and nationality of the members of the Darul Islam community," he says. Mr Dan-Ali says those found not be from Niger state may be asked to return to their home states within Nigeria. "Although the group have not been found to be engaged in anything against the law, the authorities appear to be keen to take this opportunity to disperse the community," he told the BBC.